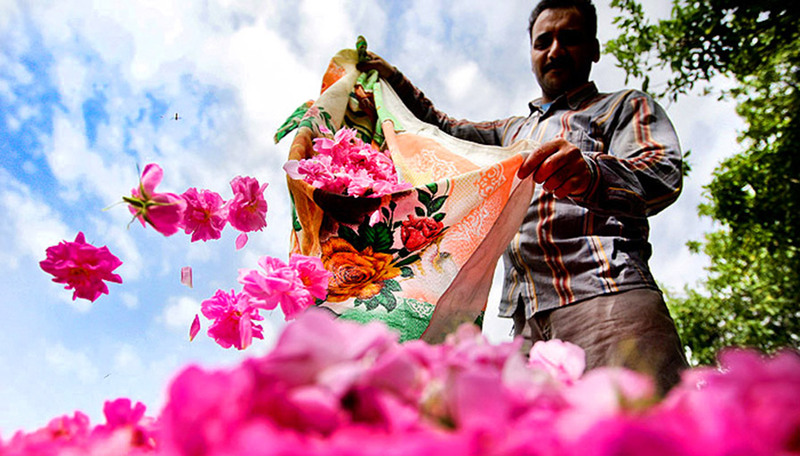 Every year around the villages of Ghamsar & Niasar, five hundred tons of roses are produced, distilled and turned into rosewater and rose oil. Flowers bloom between late April and June, depending on the spring weather. Our Rose Harvest tour departs in May to be sure of catching the roses at their peak. The entire family including children the old folk gather in their rose gardens each day to pick the flowers before sunrise with the first dew still on the petals. This way they ensure none of the fragrance is lost. The roses are picked swiftly, before the sun’s heat sets in, and collected in bags made from large pieces of cloth tied around the picker’s necks. The bags are then taken to the distillation workshops, where they will be turned into rose water the same day. Eventually, the distilled rose essence will be exported to France and Bulgaria for perfumes, and to Saudi Arabia, to bathe the holy Kaa’ba curtain in Mecca. Magic Carpet Travel’s 12-day tour is organized around the harvest but also takes in Shiraz, Persepolis, Isfahan and Tehran. Tehran Depart London Heathrow in the afternoon. Tehran Arrive early morning and transfer to the hotel. Morning visit to the Sa’ad-abad Palace complex, and a holy shrine in local bazaar of Tajrish. Afternoon visit to the National Jewels treasury and on to Golestan Palace. Dinner at a traditional Persian restaurant. Shiraz Iran Air flight to Shiraz. In Shiraz visit the Nasirol Molk Mosque, Eram Gardens and Narenjestan Palace. Overnight in Shiraz. Persepolis Morning visit to the wind swept ruins of Persepolis & Naghsh-e-Rostam. Drive back to Shiraz after lunch. Visit Nasir Mosque, then on to the Mausoleum of the poets Saadi and Hafez. On to a traditional tea house to enjoy tea and ice-cream. Isfahan Leisurely drive to Isfahan via Samirom, driving through stunning scenery including small villages and many nomad tents. Picnic lunch. Arrive in Isfahan and transfer to hotel. Isfahan Explore the Royal Square, Shah & Sheik Lotf-Allah Mosques, Royal Ali-Qapu Palace. Lunch in a traditional Persian restaurant. Visit the beautiful Khaju & Si-o-se Bridges. Tea at the Under-the-Bridge Tea house. Evening visit to the House of Strength to watch this traditional Iranian sport : a combination of physical and spiritual aerobics. Isfahan Morning visit to Chehel Sotun (Forty Columns) Palace & the Shaking Minarets. After lunch visit the 4500-year-old Zoroastrian Fire Temple. On to Vank Cathedral. Onto Jame mosque Evening option to visit the bazaar. Yazd Drive to Yazd via Nain, where you can visit the Jame Mosque and a traditional textile workshop. Yazd Full day tour of Yazd including the Atashkadeh (fire temple) where the sacred fire has been burning since 470 AD. On to Jame’h mosque. On to visit to the Towers of Silence, the ancient Zoroastrian burial grounds. Kashan via Abyaneh Early morning drive to Kashan via Abyaneh, a picturesque village dating back 1600 years & UNESCO protected world heritage site. After lunch sightseeing in Kashan including the beautiful Fin Garden, the old houses of Borujerdi (Samovar merchant) and Tabatabaei (carpet merchant). Tehran Early morning visit to the village of Niasar to watch and take part in the rose picking and see the distillation process. After lunch, at leisure to explore the village including the best preserved Sassanian fire temple in Iran dating back 1600 years. Afternoon drive to Tehran. Farewell dinner at a traditional Persian restaurant. London Depart from Tehran to London early morning. Cost Indication on British Airways for return Economy flight £650 per person including airport taxes.